Minya (Arabic: ? ) is the capital of Minya Governorate in Upper Egypt. It is located approximately 245 km (152 mi) south of Cairo on the western bank of the Nile River, which flows north through the city. The name of the city is derived from its Ancient Egyptian name Menat Khufu, meaning the nursing city of Khufu, linking it to the Pharaoh Khufu or Cheops, builder of the Great Pyramid at Giza. The name Minya may also have originated from the citys name in Sahidic Coptic Tmoone (f ??????) and in Bohairic Thmone (????? ), meaning "the residence", in reference to an early monastery formerly in the area. It is the city where the Codex Tchacos was discovered. Minya is dubbed by the locals "Bride of Upper Egypt", in reference to its strategic location in Middle Egypt as a vital link between the north and the south of Egypt. Minya has one of the highest concentration of Christian Coptic population in Egypt (approximately 50% of total population). It is the home city of the Minia University, Suzanne Mubarak Center for Arts, the new Minya Museum, and the regional North of Upper Egypt Radio and Television. 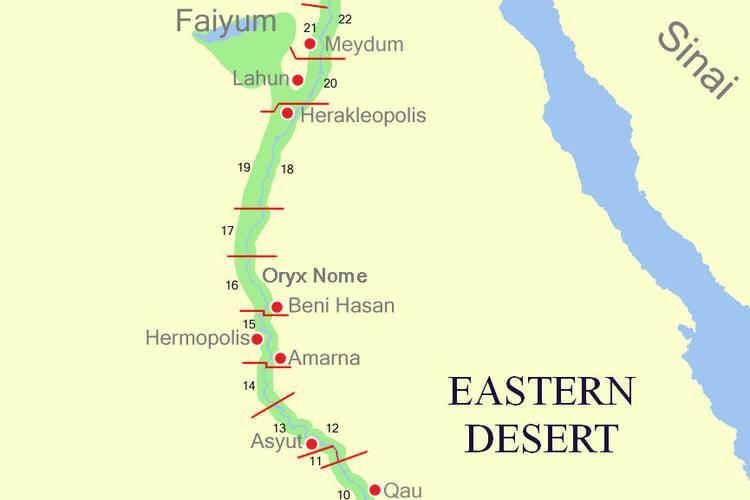 During the Predynastic Period (before 3100 BC), the area encompassing modern day Minya and its surrounding lands formed the 16th nome (district). It remained an autonomous city-state until the ruler Menes unified Egypt around 3200 BC. At the time of its unification, Egypt was divided into 42 nomes. The 16th nome was also called the Oryx nome, probably due to the prevalence of the Oryx, one of the antelope species that inhibited the area. The public sector predominates in industry, controlling most of the production of capital and intermediate goods. Among the state-run industries are cement, chemicals, mining, fertilizers and agricultural industries. The private sector is active in manufacturing of consumer goods, particularly in small enterprises in and around the city. The principal private industries are food products, furniture, and metal and woodworking. Although rich in history, tourism plays a trivial role in the economy of Minya due to the violence that dominated the area in the 1990s when the government was fighting militants.